Below, Greenwich’s Nadia Sotgiu reacts during the victory. GREENWICH — Watching the Greenwich High School girls volleyball team keep its opponent on the defensive was nothing new to Steve Lapham during Tuesday’s FCIAC Tournament quarterfinal-round match against Darien, yet the Cardinals coach couldn’t help being surprised at just how efficient his squad was. The host Cardinals outdid themselves in the opening set, rolling to a 25-4 victory — a win that helped catapult them into the conference tournament’s semifinals. Top-seeded Greenwich added another decisive victory to its ledger, defeating eighth-seeded rival Darien 3-1 in the FCIAC quarterfinals. Greenwich, which won the match by set scores of 25-4, 25-14, 19-25, 25-12, plays fourth-seeded Brien McMahon in Thursday’s FCIAC semifinals at Fairfield Ludlowe High School. Senior tri-captain/outside hitter Nadia Sotgiu registered a team-best 23 service points, including seven aces, and added 14 kills and nine digs for the Cardinals (18-1). Both Sotgiu and Rafferty were recently announced as All-FCIAC First Team selections. The Blue Wave (9-10), who lost to Ludlowe in last season’s FCIAC Tournament final, received three kills and two blocks from junior Caroline Martzolf. Sotgiu’s 13 consecutive service points enabled Greenwich to jump out to a 16-1 lead in the first set. Rafferty posted two kills, while junior setter Nicole Wood had a kill and a tip during the Cards’ big run. Wood tallied 34 assists, senior tri-captain and libero Micaela Lew had seven digs and junior middle hitter Erika Hauschild notched nine service points with two aces for the victors. The second game was closer, but Greenwich pulled away behind several kills from Rafferty and by keeping the pressure on the Blue Wave. Hauschild served out the second set, giving the home team a 2-0 advantage. The Blue Wave’s best moments came during the third set. The visitors held leads of 11-5 and 18-12 en route to cutting Greenwich’s lead to 2-1. Senior Maddie Corman’s ace closed out the second set. Greenwich, however, wasted little time in regaining the momentum. Nine consecutive service points by Sotgiu, coupled with a pair of kills from junior middle hitter Tara Ford put the Cards on top, 11-2. Lew sealed the victory with an ace. 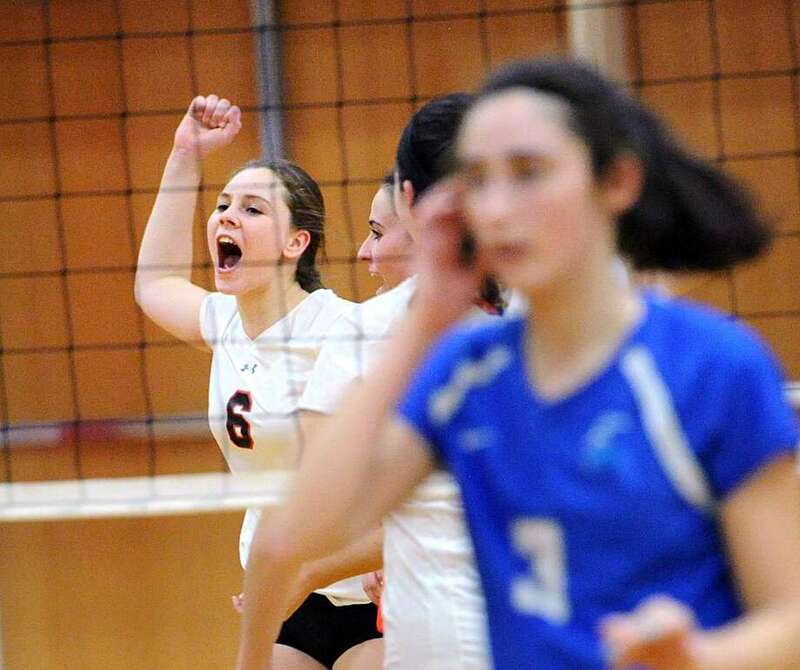 Senior Thea Bolton contributed two blocks and one kill for Darien, which turns its attention to the state tournament. Greenwich, which last won the FCIAC title in 2013, shifts its focus to its semifinal-round matchup against McMahon.